She is working as academic and design consultant with reputed institutions. She is in the field of teaching, research and development, since early 2005. She has done Masters in Home Science in Textiles and Clothing from Lady Irwin College, Delhi University. She was awarded ‘Best Student Award’ in Textile Design in M.Sc. Textile & Clothing. She has qualified U.G.C NET in December 2005. Ph.D degree was awarded in Fabric and Apparel Science, Department of Home science, Lady Irwin College, Delhi University in May 2015 on thesis title ‘Capacity Building of Artisans for the Sustenance of Traditional Chamba Embroidery’. She was empanelled as designer in Textiles and Clothing with the Office of the Development Commissioner (Handicrafts) in October 2013 and December 2016. 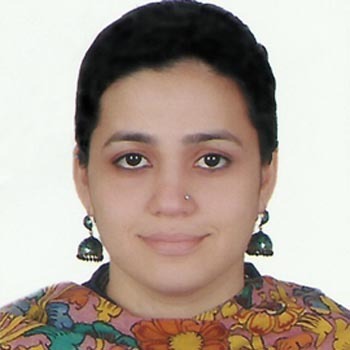 She has seven years of teaching experience in premium colleges in Delhi and Chandigarh namely Lady Irwin College, Mata Sundri College for Women, Government College of Home Science and NIIFT. Numerous research papers were presented in International and National conferences. Several research papers and proceedings were published in journals and books. She has eleven years of experience in field of craft. Several workshops and exhibitions were coordinated with the artisans to upgrade the existing skills of the artisans. In recent times, she was invited by Dr. Kapila Vatsyayan, Chairperson, International Research Division and Life Trustee, India International Center to display the exhibition of embroidered products from Chamba from 17 February’ 2018 to 26 February’ 2018. The exhibition was inaugurated by Development Commissioner (Handicrafts) Shri Shantmanu, IAS, Ministry of Textiles, Government of India. The exhibition was visited by eminent scholars, well covered by several newspapers and also featured on Rajya Sabha TV. The exhibition was supplemented with demonstrations, workshops by artisans from Chamba and symposium for disseminating information on sustaining the rich cultural heritage of Indian textiles. Lately, she has placed proposal under cultural exchange programme by ICCR for display of exquisite embroidered products from Chamba in major events worldwide which has been accepted. The date and host country is yet to be announced.